Push Notifications vs. In-App Messaging: What's the Difference for App Marketing? This post was originally published on March 6, 2014. From time to time we re-publish posts that have proven to be valuable to mobile marketers. Each time we do, we refresh data, examples, and ensure that all content aligns with current best practices. Updated 7/18/17. Mobile is personal. It’s more tailored to user interests than any other before it, which means app marketing has to be less about blatant agenda pushing and more about targeted engagement. App messaging techniques are a key part of this strategy, working to reach the user at the right time, with the right content, to engage him or her further. The two most important are push notifications and in-app messages. So, what's the difference when it comes to your app marketing? Push notifications are probably what comes to mind when you think of mobile app messaging; most marketers use it often because it’s an easy-to-implement industry standard. But since 2014, in-app messaging has become much a much more widespread in mobile marketing. Used to highlight new features, showcase special offers, onboard new users and more, in-app is a powerful tool to create more targeted, purposeful user sessions. Our research has shown that apps who use it see a 27% increase in app launches, and a 3.5x increase in retention. But when do you use a push notification, and when is an in-app message the right call? Let's discuss! When you get them right, push messaging drives latent users back to your app and brings awareness to mobile campaigns. 2 awesome push examples on one screen--how’d we get so lucky? Free People uses imagery of their latest fashions to entice the user, while Starbucks creates a sense of urgency with a reminder about the conclusion of their popular Frappucino Happy Hour. One major concern: misuse. Push notifications can be irritating and ineffective without context or purpose, or if they're only used for one purpose, like promoting products. When misused, push marketing is no more effective at promoting app usage than banner ads are at encouraging website visits. Overdo the notifications, and you risk a frustrated user or an uninstall. With push notifications, you have the power to engage users outside of your app whenever you’d like. This content can serve as a reminder to use the app more frequently, notify the user of a special offer or sale, or identify important updates. When they are customized, timely and warranted, push messages drive big results. (For additional insight, check out our post on creating successful push messaging). In-app messages are notifications displayed while the user is active within the app itself – also referred to as native app content – that create a structured nurturing process and prolong session time. This form of messaging is highly contextual and rooted in analytics, and can be triggered based on user interactions. Waze uses an in-app message to alert users to a feature that they may not yet be aware of, but could improve their experience. And they do so at the right time--when the user's active in the app. Because of its tailored style, in-app messaging is better at delivering based on user context and expectations, creating a more seamless progression from initiated session to conversion. In-app messaging should feel like a natural part of the app, not additional marketing, and can be used by marketers to fine-tune app content or promotional strategy. 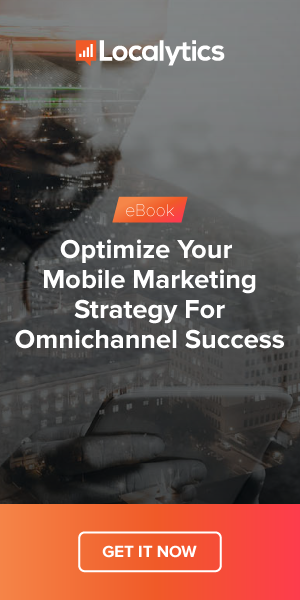 One of the best in-app use cases is for mCommerce; identifying when users are most likely to buy and delivering promotional in-app offers at the optimal time, which boosts conversions and purchases. In-app messaging also allows for extended experimentation, with A/B testing and various contextual options to see what resonates most with users. Another popular use is to create onboarding experiences for new users. Successive in-app messages can show new users your most popular app features, or clarify exactly what kind of value your app can offer users. It’s one of the most common ways you’ll encounter in-app messages, and for good reason: in a case study with Slice, we found implementing onboarding increased retention rates by 50%. Google Photo's onboarding looks like a typical screen. But the advantage of using in-app is that because onboarding is a temporary experience triggered by a user's first, as soon as the user clicks get started they dive right into the app, and the in-app message disappears. But this comes with its own set of challenges. Without the right tools, testing of in-app messaging is difficult to implement and track. Plus, once a user qualifies, it’s not easy to remove him or her from that test, sometimes to the user’s dismay. It’s hard to get right, because you need to understand and act on your analytics. We’ve outlined five ways brands can win using in-app messaging to address this bottleneck. In-app messaging is the most effective way of creating a stronger, richer app experience by segmenting and tailoring to target audiences. It creates a more valuable app session by providing the user with personalized messages, and can funnel actions to conversions. Here’s what it comes down to: like most modern marketing techniques, push and in-app messaging work best when used together as part of a larger mobile marketing strategy. When you use both, you're much more likely to ensure your app is meeting the different needs of your users. But they don’t just exist separately; layered messaging works in tandem. If your in-app messaging campaign is triggered by app opens, but you have a low open rate, consider running a push marketing campaign to prompt more opens. By using push notifications to re-direct users who have fallen out of a desirable funnel and in-app messaging to control visitor flow, you can focus the user toward a desired action. A holistic, thoughtful approach to messaging means better app usage analytics, more engaged users and higher mobile commerce revenue. And, just as importantly, the user will feel that he or she is getting the best experience possible.